Technology Enhanced Teaching and Learning: Promise of Hope or Technolust? ICT: Technolust or Promise of Hope? In my past educational technology leadership classes, I often began by stating, “If you truly believe the educational technology that we are going to explore today does not have the potential to inspire and lead to higher levels of classroom engagement and learning, find another tool that does.” Underscoring all of my technology-enhanced teaching and learning investigations is a discussion of the pedagogical underpinnings for a particular technology’s use. A critical, complex, and often misunderstood relationship exists among the use of information and communication technology (ICT), the practice of teaching, and the affiliated act of learning. As argued by Kirkwood and Price (2006), ICT merely offer tools to help students and teachers attain educational outcomes. Although not a new message, central to their argument is the idea that, although technology can enable new forms of teaching and learning, ICT alone will not somehow magically afford itself to educators; it must be driven by educational purposes. The problem of “putting the “T”(echnology) before the “P”(edagogy),” Lin (2007) views as having some inherent and serious ethical issues. According to Lin, the key ethical issue is that the technology often takes precedent over the learning needs, “or each new technology is used as a replacement for all existing learning methodologies” (p. 416). PS- technolust is a big problem in our schools…given this time of considerable fiscal restraint, schools can’t afford to be purchasing expensive technologies without having first truly researched and explored their impact on learning. I suggest making vendors more accountable by allowing trial periods for educators and students prior to purchasing….just one of my principles of technoresiliency! Graham, R (2013). Inspirational Transitions: Cultivating the Capacity to Embrace Technology-Enhanced Learning and Teaching in Elliott-Johns, S.E. & Jarvis, D.H. (Eds). Perspectives on transitions in schooling and instructional practice. Toronto, ON: University of Toronto Press. 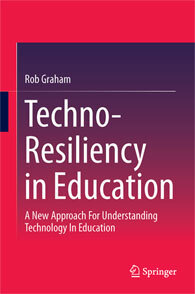 This entry was tagged education, educational technology, resilience. Bookmark the permalink.